Nice isn’t it? Instead of a full episode of Adventure Time (or any other series), I’m greeted with a nice reminder that I don’t, in fact, have cable or satellite. 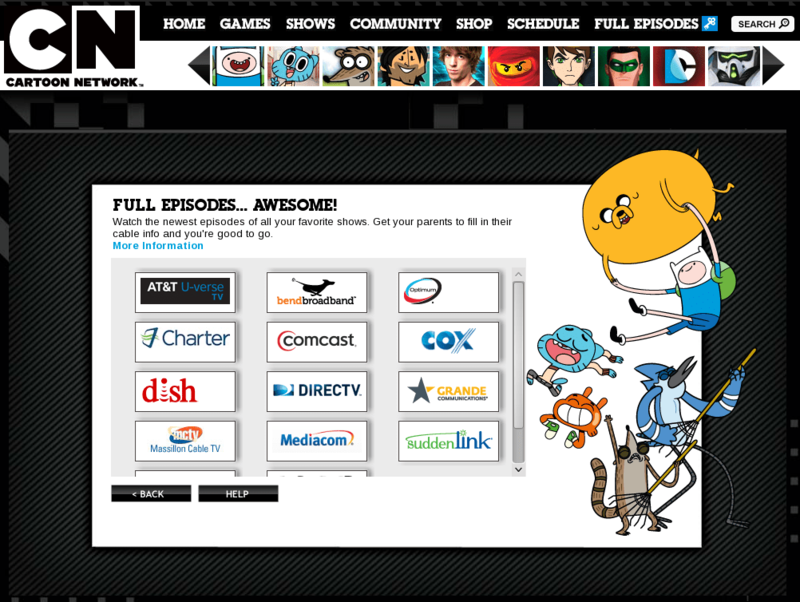 While I heartily laugh at the subtle suggestion that I start forking out and arm and/or leg for channels with more commercials than content, this screenshot nonetheless represents Cartoon Network shooting themselves in the foot and taking aim at Adventure Time fans too. Why? The answer is simple. By restricting online streaming of full episodes, guess what that does? It not only inconveniences fans who want to catch up on the latest episode, it also directly prevents new fans of the series from increasing their enjoyment of the show. Surely the whole point of entertainment is to get as many eyeballs on it as you can, right? Turner Broadcasting seems to think differently however, and would rather cut off fans both old and new from their favourite show, by extension reducing the audience and the market for any merchandise. Now that is not to say that the show will disappear, even the post on reddit is called “This is why I torrent” alluding to the fact that the show really is that good. The downside for Turner and Cartoon Network is that any fan who moseys on over the torrents is a lost fan, one whose interest (and potentially money) is directed away from their operations. If I were studio chief, I would have serious misgivings about seeing fans go elsewhere for the sake of ensuring that only paid-up subscribers see the legitimate stream. Excuse me? The episodes are still available on iTunes, and on TV, and you’ll be able to watch the episodes at a later date anyway! This post seems more like whining than a debate. Ah, true, yes, but not everyone has iTunes and the post does point out that I lack cable, as do plenty of other folks. I don’t believe it’s whiny insofar as I’m not complaining about my lack of access to episodes, but it is insofar as Turner letting viewers escape their influence by heading to the torrent sites. You see, consumers have this awful knack for wanting things NOW, and every time a company fails to cater at that level of service they lose out, as Turner is in this case.